Australian author Williams (May We Call You Grandpa?, 2013) offers young readers insight into the lives of the small crustaceans called yabbies. 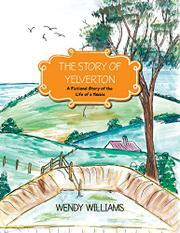 Yelverton is a yabbie, a shellfish that lives at the bottom of a dam, and in this book aimed at a young audience, he explains his life cycle and some of the hazards of his dangerous existence. The nature illustrations that accompany Yelverton’s casual explanations give a somewhat scientific flavor to the book’s early sections, as Williams depicts the “berry” eggs under a mother yabbie’s tail, the growth of a yabbie from egg to egg-head, and small yabbies eating a larger yabbie alive when the older crustacean’s shell is in a soft state. The images, with their diagramlike flair, are among the most intriguing in the book; others are uneven, particularly depictions of birds. As Yelverton catalogs the dangers of his life under the dam, he shares general environmental concerns about subjects such as dirty water and humans’ yabbie traps. The yabbie seems unconcerned by the dangers, however, which may cause young readers not to empathize with him. His limited point of view falters about halfway through the text, when he relies on a passing swallow and seagull to tell him about the fate of captured yabbies. Although the author ably handles the subjects of danger and death early on, she neglects to explain exactly what humans use yabbies for. Are they eaten, used for bait or both? Australian audiences might be more familiar with the little crustaceans, but Americans may be baffled. Other readers may want to look up details the book leaves out, such as the region of the world in which yabbies may be found. A well-researched but lackluster children’s book.